The Greek government has backtracked on its decision to suspend professional football in the country indefinitely. The suspension - the third one of the season - will now last a week and cover just the Greek Super League. The government took action in a bid to crack down on football violence. The suspension follows violence at Sunday's Super League match between Olympiakos and Panathinaikos, as well as a brawl between club officials at a board meeting on Tuesday. It had been announced earlier on Wednesday that all professional matches would be suspended "indefinitely". But after a second meeting with Prime Minister Alexis Tsipras, deputy sports minister Stavros Kontonis confirmed that the suspension would be limited to this weekend's top-flight action. Kontonis said the government and football authorities would reconvene next Wednesday and the Super League would only resume on condition that promises given for containing crowd violence were adhered to. Deputy sports minister Kontonis: "Under the current circumstances, it is impossible to have Super League games played this weekend. "The decision of the government regarding the combatting of violence is definitive and irrevocable. If the situation remains the same, there will be another suspension." Greek football journalist Panos Polyzoidis, who was at the Panathinaikos-Olympiakos match, told BBC Radio 5 live: "The league was recently suspended, but this decision indicates the government's inability to come up with concrete measures to tackle the problem. "Football-related violence has been going on 30 or 40 years and the state has not taken any systematic measures to tackle problem. The suspension will make no difference." 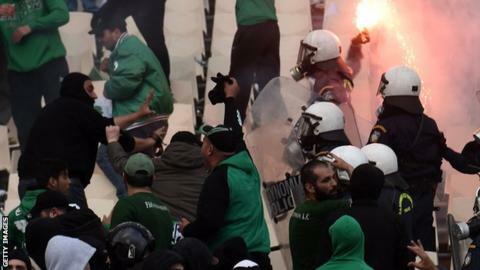 Fans hurled flares, rocks and bottles at officials during Panathinaikos's 2-1 victory over leaders Olympiakos. An executive meeting of Super League officials was then called off after a Panathinaikos official claimed he had been punched by Olympiakos security personnel. The first suspension followed the death of a fan after clashes between fans of third-division teams Ethnikos Piraeus and Irodotos. The second followed an assault on the assistant director of the refereeing committee.